An amazing chemical free, lightweight, tinted broad spectrum sunscreen! Contains physical blocks zinc oxide (Z-COTE�) and titanium dioxide, as well as artemia salina, a plankton extract and anti-oxidant. Applies as a silky sheer fluid that dries quickly and leaves no residue. Color can be used by all skin types. Water/Sweat Resistant. Ingredients: 5% Zinc Oxide, 6% Titanium Dioxide. Water, Dimethicone, Isododecane, C12-15 Alkyl Benzoate, Undecane, Triethylhexanoin, Isohexadecane, Nylon-12, Capylyl Methicone, Butyloctyl Salicylate, Phencythl Benzoate, Styrene/acrylates Copolymer, Silica, Tridecane, Dicapylyl, Carbonate, Dicapylyl Ether, Talc, Dimethicone/PEG-10-15 Crosspolymer, Aluminum Stearate, Pentylene Glycol, Peg-9 Polydeimthcylsiloxyethnyld Iethicone, Alumina, Polyhyroxystearaic Acid, Phenoxyethanol, Magnesium Sulfate, Capylyl Glycol, Iron Oxides, PEG-8 Laurate, Disteradimonium Hectorite, Triethoxycapylylsilane, Tocopherol, Propylenen Carbonate, Artemia Extract, Benzoic Acid, C9-15 Flouroalcohol Phosphate, Peg-9, D46941/2. Shake well before each use to ensure even distribution of active ingredients. 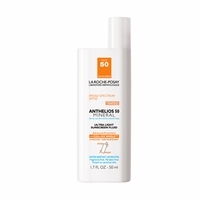 Apply daily to face, neck, and chest, and reapply before sun exposure. Reapply every two hours and after towel drying, swimming, or excessive perspiring. For optimal results, use after a SkinCeuticals antioxidant and moisturizer.